Vakantie Meerlo is versatile in renting of holiday accommodations. Are you going on a trip with family, friends, or just the two of you? Vakantie Meerlo offers group accommodations, holiday homes, hotel rooms, and rustic huts. In total 53 beds and multiple common rooms are at your disposal. A holiday paradise for young and old, those seeking peace and quiet and more active types, large groups and smaller companies. 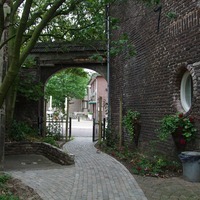 The 17th century buildings are situated on the edge of nature reservate “De Oude Maasarm”. The ideal starting point for a calm or an active holiday.